is the vital point. Now a and b are miai. If , lives with a bent four. 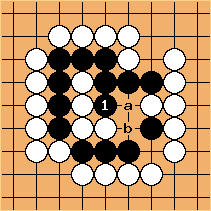 ...and if White throws in, Black captures and then a and b are miai to make two eyes. Brent: Oh, right. is much better, thanks! From this last variation, it looks as though Black can only expect two points of territory, although of course he captures more white stones as well...? If White is allowed to play (it really doesn't matter where Black plays first), then White almost fills with a bulky five and Black is dead. Bill: 3.5 points of territory plus 4 captured stones. For extra credit, why is it only 3.5 points of territory and not 4? Brent: I'm still not sure about miai counting, fractional points, etc. 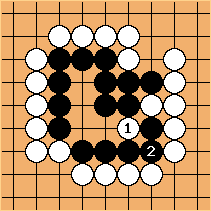 But I'm guessing the answer is that a play at a is worth one point in gote, hence 0.5 in miai counting. (right?) If Black at a, then Black has one connected group surrounding a bent four -- hence four points. If White at a, then Black will eventually have to defend at b (probably after White c which is now sente), and Black only gets 3 points. If Black plays at , he will have 4 points, while if White plays there, Black will have only 3 points. 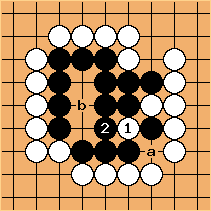 After , Black will either have to protect with , or White has two ko threats with - and - . 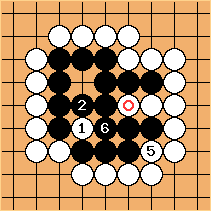 Since this is a gote position, we count Black's territory as the average, 3.5 points. Brent: I get it, thanks!